It is virtually impossible for someone who has never experienced a spinal injury to try to explain to someone recently injured or struggling subsequently in other ways that ‘everything is going to be alright’. If someone in this situation can speak with a tetraplegic person who has managed to overcome the various difficulties, particularly in relation to sport, then the responses are likely to be much better received and the result more meaningful. Whilst Regain can hand out grants for wheelchairs and other specialist equipment it is not always a money issue that is the challenge. We know that often, a few reassuring words definitely helps someone get the perspective they need to focus their mind and continue living their life to the max. Tetraplegics are as mentally alert as any able bodied person; they have the same emotional needs and desires. In the earliest days and weeks after injury, emotions run high and qualified support both clinically and psychologically is vital to see people through these initial periods. Only a person with a spinal cord injury can really explain and demonstrate how life can go on with this injury. In many cases people have achieved things that they never believed possible. 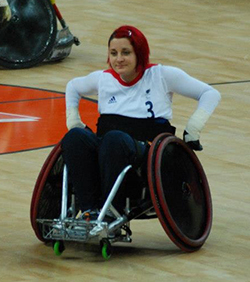 Regain proudly supported four tetraplegic individuals compete in Rio Olympics 2016 namely Kylie Grimes, Alex Rickham with same results as 2012, Steve Osborne and Bulbul Hussain. With Regain’s support your dreams could lead you to Rio de Janeiro for the 2016 Paralympic or other goals that you might have! Many tetraplegics have also been encouraged to complete a range of events such as overseas cycle challenges, including cycling in India and South Africa recently. Others have been assisted in relation to employment and/or have embarked on training, educational and vocational courses. Regain ‘buddies’ can demonstrate a wide range of interests, hobbies and leisure activities which they are happy to share. Regain has over 250 tetraplegics registered on its database including many who are willing to help! If you feel you can also help and would like to become a ‘buddy’ please do get in touch with us. Our aim is to provide a listening ear and to offer words of comfort and support. It may well be that ‘buddies’ simply telling their own sports related story to someone can act as a catalyst to improve confidence, optimism and aspiration for recently injured tetraplegic individuals. We do not attempt to offer detailed professional advice on legal, financial, clinical or even technical matters such as wheelchair skills – although a ‘buddy’ may well be able to sign post you in the right direction for more specialist support. Let us also not forget the importance of friends, families and carers all of whom can also need support and advice at certain times. Once again our database can be utilised to put the appropriate people in touch, providing a comprehensive list of contact points for all concerned. Finally, a reminder that specialist advice on matters relating to sport is a unique facility that can be provided by many of our buddies so please do not hesitate to get in touch and we will do our very best to provide this support for you.